This is the discussion thread for The Birds (1963). Post about anything that comes to mind about the film here. I've seen two Hitchcock films in the cinemas, North by Northwest and this one. For The Birds there were some snickers from the audience over what are clearly some rather dated, or even cornier, moments or lines of dialogue, but I don't remember the exact moments anymore, and I don't think anyone meant any harm by it but it does take you out of the moment. Still, I think there's so many great moments in the movie that even a modern audience can appreciate it. I grew up watching it, so I've seen bunches of times, and the scenes that always stood out to me were the various attacks. The one on the playground when the birds start gathering on the monkey bars. The shots of the dead people with their eyes missing, the scene inside the phone booth, and the suspense of waiting for the birds to attack when they're inside the house. Finally my favorite moment is the god's-eye view of the birds coming down to attack. I'll ask what people think of the lack of music in the film. I think it's effective and the use of bird sound effects in its place is very much ahead of its time. It's not one of my favorite Hitchcock films but it surely was when I younger. I just finished watching this. I'd never seen her before, but I liked Tippi Hedrin. Like Aline, I think I preferred her classier, understated, and less sassy personality, to Grace Kelly's performances, but they're both very attractive ladies. I'm a fan of Suzanne Pleshette's, since I like the "Bob Newhart Show," so I was pleasantly surprised to see her in this film. I bet most people feel differently, but I don't like how we never discover why the birds went insane and started attacking all the townspeople. Without some explanation being provided, it makes the movie seem wildly unrealistic. To answer Doug's question, I was actually okay with there not being a soundtrack to this movie. In fact, until I read Doug's post, I didn't actually notice that the only sounds that we heard were the terrifying birds screeching. Overall, I found it to be a very strange movie, but am glad that I finally saw it. Now whenever someone mentions "The Birds," I'll be able to follow the conversation, and maybe even contribute some thoughts. AKA, you have seen her before ... in Marnie. She has 84 credits as an actress in the IMDb, but she is best remembered for these two Hitchcock roles at the beginning of her career. Thanks KC. Wow. This is the second time that I have not recognized an actor or actress that I have seen before in other Hitchcock movies. What is wrong with me these days? Maybe it had to do with the Love Birds being transported around in that tiny cage. I mean, there's no official reason, but it does all start as soon as Melanie brings the birds to Bodega Bay. Mitch Brenner says it in the pet shop, I don't have an exact quote just now, but he mentions how sad it is seeing birds stuck in cages when they should be flying free. I never understood how somone could keep a bird in a cage either. What a gift they have, and to clip their wings and stick them in a cage is cruel. The birds may have been retaliating. That's an interesting theory, Matt. I believe the source material upon which this film was loosely based didn't state a reason either, so that's as plausible as any other potential explanation. At the very end, when Melanie is being carried out of the house, there are tons of birds all around. 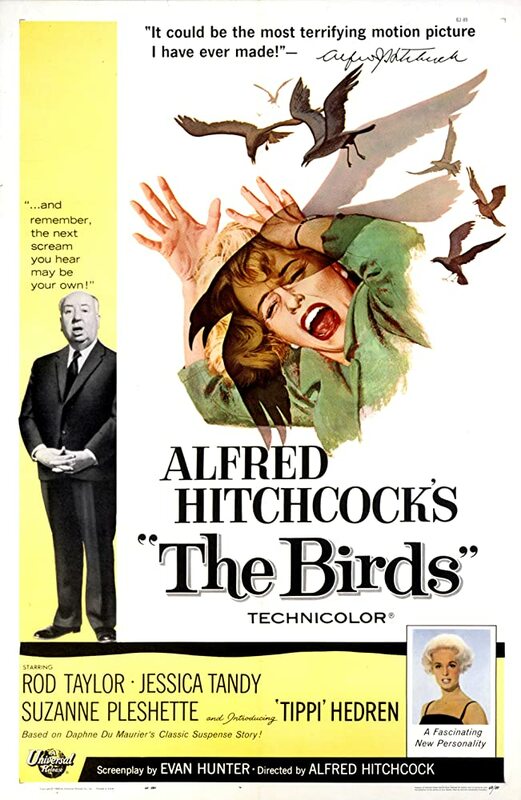 Since throughout the film, the birds attack the townspeople, and these birds had attacked Melanie in the attic earlier on, why did the birds not attack the group as they were trying to leave to take Melanie to the hospital? What do you guys think? I've always taken it to mean that it was just over now. Whatever set the birds off was through (or done, or whatever word might best fit here). The lack of explanation could be a major flaw here depending on how you look at it. I guess in one way it makes it scarier because we don't know why the birds just started attacking everyone... but at the same time doesn't this sort of movie need some explanation? I think some explanation is needed, since randomly having hundreds of birds attacking townspeople isn't something people would expect birds to do normally. During the production of this movie, I think there may have been an isolated incident related to poisoning that caused birds to act out, but this had already happened by the time that they wrote the short story/script for this, so that couldn't have been the reason within the movie. At first, I thought that the movie was symbolically intimating that Melanie's presence in the town may have had something to do with the bird attacks, for two reasons. First, because of the scene when the woman earlier in the film communicated that before Melanie's arrival in the town, this wasn't happening. Secondly, because once Melanie is severely injured by the bird attack near the end of the film, it seemed that the birds stopped their attacks and let everyone leave the house. However, the radio said that these attacks had also occurred in other areas where Melanie was not present, so what was already a pretty implausible reason initially became even more of a stretch at that point. So, as a viewer, I'm still left wondering, what caused these random bird attacks on humans, and should this be something to be expected again at some other point in the future? This hasn't aged well. Like Doug mentioned about dated dialogue and some scenes did bring unintentional laughs. The hysterical woman in the restaurant screaming, "You're the devil" and the look on Tippi Hedren's face as the fire was going from the car to the gas station. Overall, not a favorite of mine. Should we rate all the films we've seen in the challenge? The top 3 are all so good, I might flip any of them around if watching them again. But, today that's my order. We didn't do Vertigo, and that would be up in my top 5, I think. I really like his Hollywood films way more than his British works, and on my list, there is a HUGE gap between Spellbound and The Lady Vanishes. ...and the look on Tippi Hedren's face as the fire was going from the car to the gas station. You know, I've never liked the way that scene was shot, as if it was just a series of photographs as she watches it happen. What I like most about The Birds is when they board themselves up in the house. I haven't watched the movie in years, but I remember that as being a suspenseful scene. I enjoy the movie but it's never been a favorite. I think it was genius to film it that way. It works for me. Here's how I'd rank the films, more or less, since it's been a while since I've seen a couple of them, and it doesn't include Sabotage as I don't think I've seen it.